Peer reviewed rejection can be one of the most frustrating things about being a scientist. Here's some peer reviewed rejection humour with the hope that it can be cathartic for some scientists out there. I'm a terrible artist - my drawings are limited to not much more than stick figures. However, I also have a comedic mind for which I think cartooning could be a great outlet. 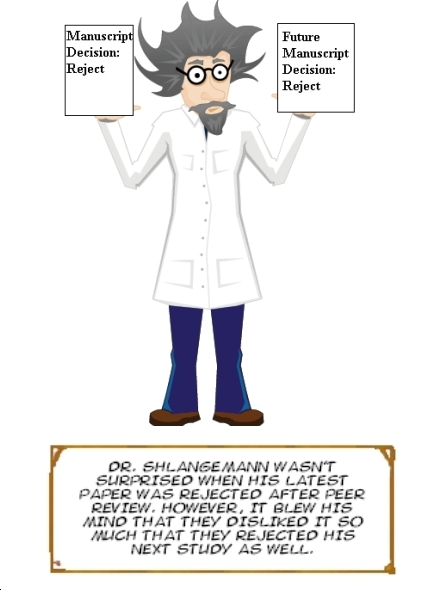 I found this picture of a scientist on the internet on a site that advertised it as free clip art and thought it would be fun to turn it into a joke about peer-reviewed rejection. I actually have an old Snoopy comic to thank for the gag but I've adapted it for scientists who are in need of a science specific version of this classic joke.